The 22nd installment in Saint Arnold Brewing Company’s Bishop’s Barrel series was released on November 26, and it appeals to more than beer drinkers thanks to an unlikely wine connection. Find it in most grocery stores, larger liquor stores and, of course, at the Saint Arnold beer garden. 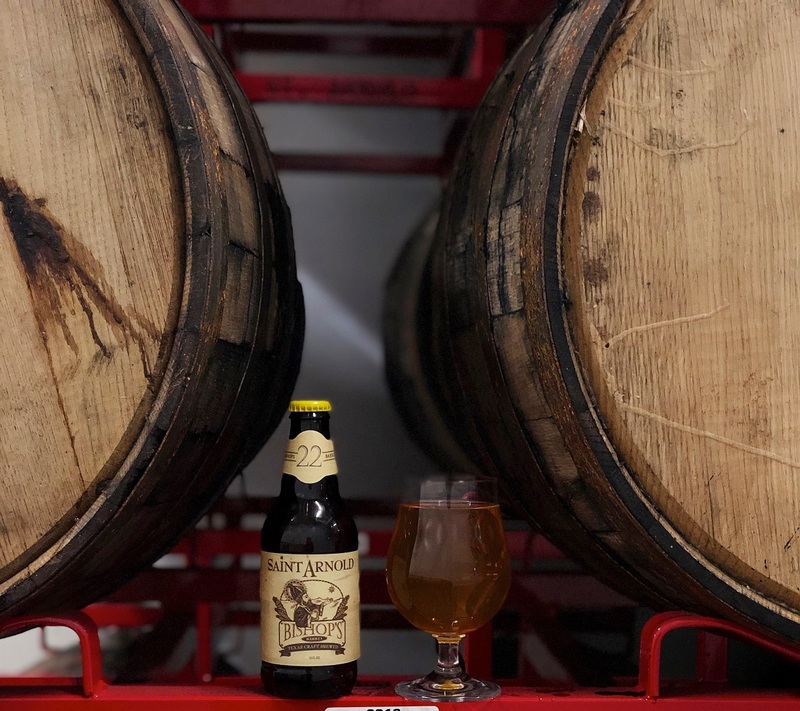 Saint Arnold initiated the Bishop’s Barrel series in 2011 to experiment with barrel aging and show how different barrels can enhance and compliment different beers. Over the last eight years, the brewery has tried bourbon, rye whiskey, rum, gin, red wine, sauvignon blanc and chardonnay barrels. As one would expect, each barrel affects the beer differently. Bourbon barrels impart a sweetness from the wood sugars in the barrel in addition to notes of oak and vanilla. Gin barrels provide juniper and pine notes; rum barrels impart sweetness from sugarcane. The base of Bishop’s Barrel 22 (BB22) is Saint Arnold’s Icon Gold — Texas Honey Saison. In response to the beer’s popularity, brewer Colin Klingemann decided to add peaches and brettanomyces bruxellensis (a wild yeast strain) and bottled it as a holiday gift for his colleagues at the brewery. It was such a success that the beer was added to the Bishop’s Barrel series. To make BB22, Klingemann added 900 pounds of apricot purée to the original peach base and aged the beer for a year sequentially in three chardonnay barrels. Fun fact: a barrel from Bishop’s Barrel 19 — a Christmas ale aged in chardonnay barrels that also used the brettanomyces yeast strain — was repurposed for BB22. 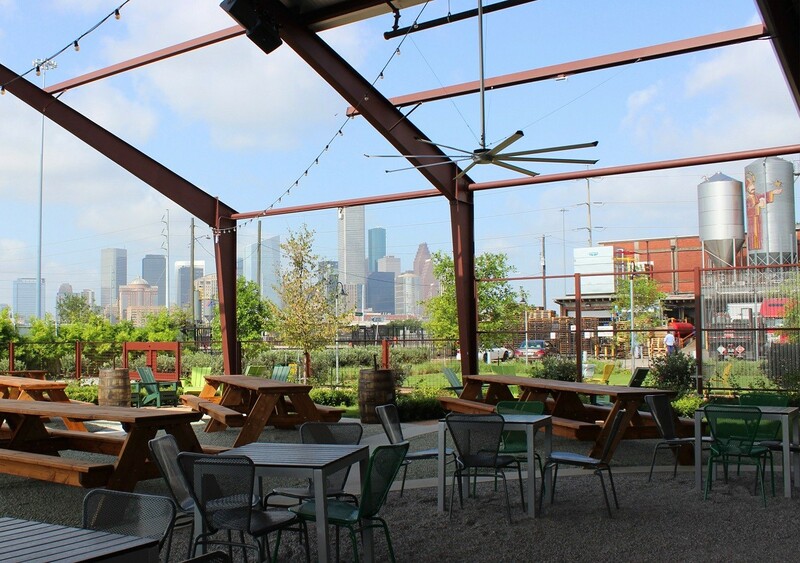 Sip a beer and gaze upon Houston’s beautiful downtown skyline. Photo courtesy of Saint Arnold Brewing Co.
BB22 pours a bright golden color with a very effervescent but short-lived head. Klingemann calls this “one of the most wine-like beers we’ve ever brewed” and we agree. On the nose, we detect strong peach and apricot notes. Though fruity, the brettanomyces bruxellensis helps keep the beer from being overly sweet; it is also the same yeast strain considered desirable in French wine and as a result BB22 is the most wine-like beer Saint Arnold has ever brewed. Instead, we’re treated to a strong citrus flavor with a soft mouthfeel. Perhaps the most surprising aspect is the 8.0% ABV—this beer will absolutely sneak up on you. Brettanomyces yeast is commonly used in many sour beers. The yeast can be very hard to control and plenty of brewers end up with a stronger sour flavor than they intended. That is not the case here because of the addition of brettanomyces bruxellensis. The effect is more muted than in the Boiler Room Berliner Weisse with brettanomyces that Saint Arnold brewed a few years back, and we think that’s a good thing. BB22 can be found at grocery and liquor stores across Texas and Louisiana. We recommend drinking the beer fresh instead of aging.